Selected Science News: BURSTING A BUBBLE? Understanding the processes that cause volcanic eruptions can help scientists predict how often and how violently a volcano will erupt. Although scientists have a general idea of how these processes work — the melting of magma below the volcano causes liquid magma and gases to force their way to Earth’s surface — eruptions happen so rarely, and often with little warning, that it can be difficult to study them in detail. 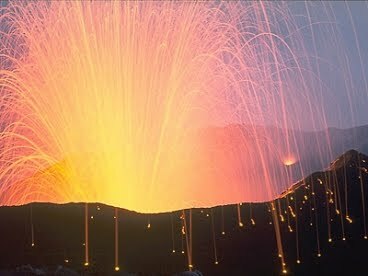 One volcano that volcanologists believe they understand fairly well is Italy’s Stromboli, which has been erupting every five to 20 minutes for thousands of years, spewing fountains of ash and magma several meters into the sky. For several decades, scientists have pretty much used one theory to explain what is causing huge amounts of gas to erupt so frequently: swimming-pool-sized bubbles that travel through a few hundred meters of molten magma before popping at the surface. But they may be wrong, according to new research by Jenny Suckale, a graduate student in MIT’s Department of Earth, Atmospheric and Planetary Sciences (EAPS), who has developed a sophisticated computer model to simulate Stromboli’s magma flow. In a two-paper series published July 20 in The Journal of Geophysical Research, Suckale suggests that giant gas bubbles can’t be driving the Stromboli eruptions because such bubbles aren’t compatible with the basic laws of fluid dynamics, or the science of how fluids move. 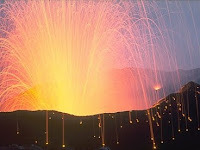 Instead of large bubbles that pop at the top of Stromboli’s conduits — pipelike openings that connect the volcano’s magma chamber to the Earth’s surface — Suckale thinks that the eruptions are caused by a spongelike plug located within the conduit, similar to a cork in a champagne bottle, that fractures every few minutes as a result of pressure created by significantly smaller bubbles. Although all volcanoes are different — some are driven by gas while others are driven by rising magma or interactions with water — Suckale says that figuring out Stromboli would be “an important step forward for volcanology” because scientists don’t really know the details of how most volcanoes function. Rethinking how Stromboli works could also shed light on the processes of volcanoes that appear to be driven by similar mechanisms as Stromboli, such as Mount Erebus in Antarctica, which has been continuously active since the 1970s. Despite having a wealth of data about Stromboli, volcanologists have really only applied one model to explain Stromboli’s continuous eruptions, Suckale says. According to the so-called “big bubble paradigm,” as magma rises to Stromboli’s surface, pressure drops, and this creates gas bubbles that merge together and can become several meters wide. Eventually, these bubbles explode at the top of the conduit. But the problem with this theory, according to Suckale, is that it conflicts with the basic principles of fluid dynamics. Specifically, magma doesn’t have enough surface tension (created when two fluids meet) or viscosity (a measure of a fluid’s resistance) to maintain bubbles larger than a few dozen centimeters. She thinks that many researchers have assumed that bubbles inside Stromboli behave similarly to bubbles in a tank of water. “People take lab models as an analog for the volcano, but the scale is so different, and fluid dynamics is so dependent on scale,” she explains. To test the theory, Suckale and co-authors and EAPS professors Brad Hager and Lindy Elkins-Tanton, as well as Jean-Christophe Nave, a lecturer in MIT’s Department of Mathematics, developed a computer model of the inner volcano’s mixture of gas and magma and the bubbles that can rupture or merge. By changing certain parameters, such as scale, she discovered that it would be physically impossible for massive gas bubbles in Stromboli to survive for longer than a second because of the lack of stabilizing forces, such as surface tension and viscosity. Suckale still believes there are gas bubbles inside Stromboli that are created by some unknown source located underneath the volcano. But she thinks these bubbles are significantly smaller — perhaps only several centimeters thick — and accumulate beneath a porous plug that covers part of the volcano. As the bubbles exert greater pressure on the plug, it eventually fractures, causing gas, rocks and liquid to scatter into the sky. This could explain why samples of Stromboli rock contain many tiny crystals — because the top of Stromboli is a spongelike plug of crystals and gas bubbles that releases lots of gas every few minutes. Kathy Cashman, a geologist at the University of Oregon, says Suckale’s modeling work “greatly advances” volcanologists’ understanding of the bubbles inside Stromboli and may also shed light on noneruptive processes in volcanoes that could also be transferring gas to the atmosphere. “Jenny’s work sits at the boundary of these two types of gas transfer, and her modeling may help to address very fundamental issues related to volatile budgets of both the magma and the atmosphere,” Cashman says. But she cautions that Suckale’s work represents a “first step” toward modeling a very complex system, and that future modeling efforts should address the effect that crystals may have on bubble behavior. Suckale agrees, but for now, she is working to develop a new model to explain how she thinks the theorized Stromboli plug works, why it could cause such constant eruptions and what this might say about other volcanoes that erupt frequently.